You can access to the Scenes Menu by clicking on Smart Scenes voice between the Data Connectors field and the Smart Actions one. A Scene is a sequence of commands that perform one or more functions. 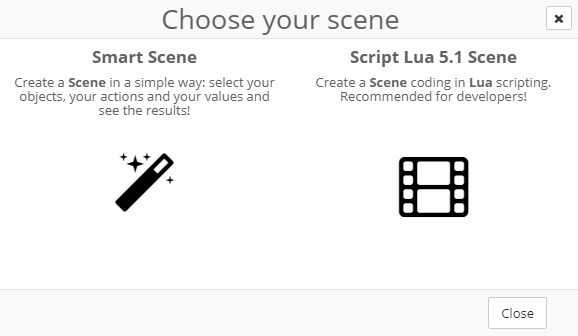 These Scenes are coded with a scripting language called: Lua. Each Scene may act on a Node, a Variable, a Gatewasy or even on another Scene. They are pure Lua code inserted and executed by the User. It's not recomended for beginners. Then we convert the Temperature into an integer type and compare it. If the Temperature is higher than 30, we call resiot_sendemail wich, obviously, send an e-mail with object and subject. If the Temperature is lower than 30, we set the value of the Variable "Temperature" to "The temperature is lower than 30°C" .